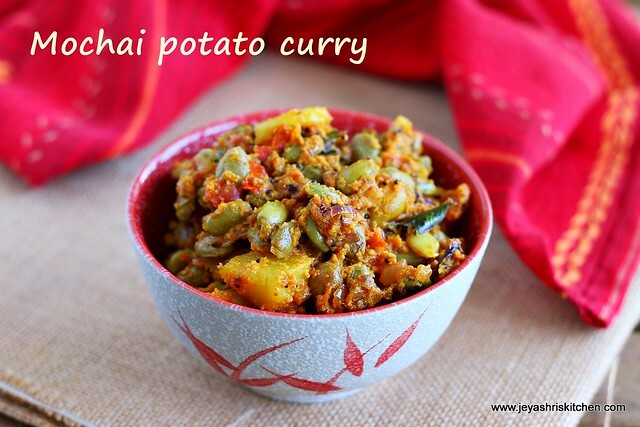 Mochai |field beans and potato is a match made in heaven. Even the combo of brinjal and mochai is also will be awesome. Last year itself i wanted to post this curry but somehow couldn't make it. Few days back when i went to little india, i found the fresh mochai |pacha mochai (called as field beans) I have already posted mochai sundal and mochai brinjal kara kuzhambu, but both recipes are using dried mochai. 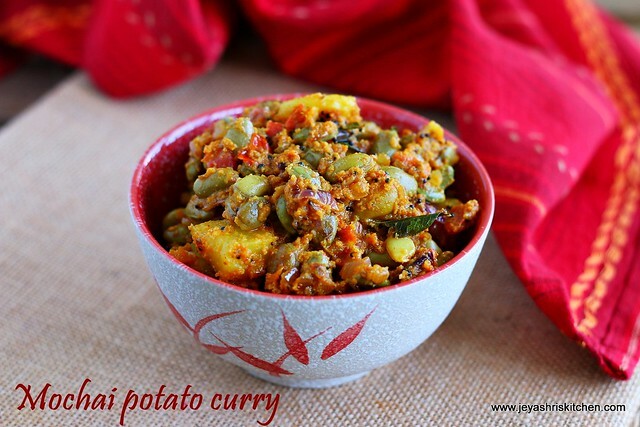 Thsi curry i have tasted many times from our neighbour aunty's house in madurai. Again called her up and confirmed the recipe with her. In the original recipe, she mentioned to add whole garlic before adding the onions. But since mine were too big, i didn't add. If you have the small garlic with you add it whole , without chopping it. Cook the mochai in pressure cooker for 3 whistles by adding little salt to it. Pressure cook the potato and peel the skin and cut them into cubes. Do not over cook the mochai and potato. Finely chop the onions and tomato. Peel the skin of the shallots and grind the coconut, jeera (or sombu), shallots, garlic(if adding) and red chili powder into a fine paste. Add little water while grinding. In a pan add oil and add the mustard seeds and curry leaves. If adding garlic pods do add at this stage and cook well. I have big garlic only so i don't want to add. Do add the small garlic pods if you have that in hand. Add the tomatoes and cook for a while. Now add the ground masala to this and cook for 3 minutes in a low flame. Add salt to this. Do remember that we have added little salt while cooking the mochai too. Now add the cooked mochai and potato. Mix well and saute for 5 minutes in a low flame. Switch off the flame . Serve it hot with plain rice and rasam. A heavenly combo with Garlic |poodu rasam and hot rice. Instead of red chili powder you can add dried red chili too. Ensure the mochai is not overcooked. Else it will upset the tummy. This goes well with chapathi too. Is this Lima beans? ?does any one know where can I get in usa?or its English name please? This is called as field beans in English, and only the dried version is available in some Indian stores in US. I have never seen the fresh ones even in Indian grocery stores. Lima beans are different, but I think it can be substituted in this recipe. Jeyashri, pls confirm. The dried version (frozen) are sold under Deep brand in USA. thank you all, missed replying here. You can surely replace lima beans or butter beans or even green peas too. Hyacinth beans aka Chikkudu ginjalu in Telugu, Papdi lilva in Gujarati. Avarakkai Tamil. Frozen Papdi lilva are sold in Indian stores in USA.